💥 Hersey Hawkins 💥 SG. ⚡️ Auto Autograph Historic Contenders 74/99 Panini Contenders Card ⚡️. 🎗 Autograph Veteran Signatures Historic Contenders Parallel 74/99 Card# 34 🎗. The card is serial numbered 312/499 and includes a Panini authenticated autograph from Butler. 2012-13 Panini Intrigue IMPACT ROOKIES Tobias Harris RC AUTO #76/99 76ers HOTT! All cards are in Near mint to mint. JIMMY BUTLER (RC) 2012-13 Panini Brilliance #257 - 76ers Superstar! **Mint! 2012-13 Momentum Jimmy Butler Momentous RC Red Auto BGS 9 Mint ~ True #1! Numbered 1 of 10! This card has been graded by Beckett (BGS) 9 Mint Autograph 10! Subs are 9.5~9~8.5~9.5. 2012-13 Panini Marquee Autograph Of George McGinnis. 2012-13 Prizm Silver Prizms Allen Iverson #187 PSA 10 GEM MINT! 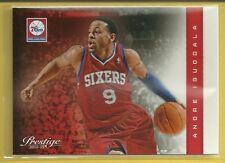 2012-13 Prizm Silver Prizms Allen Iverson #187. NO exceptions. JIMMY BUTLER 2012-13 Panini Contenders Autograph Rookie RC Auto Signed 76ers! 2012-13 PANINI PAST AND PRESENT JULIUS ERVING AUTO!! RARE SP 2012-13 Hoops Lavoy Allen 2 DIFFERENT RC AUTO lot(2)!